Just a couple of days after visiting the Sussex County Library to share the story of the Cat Swamp hijacking and murder, we found ourselves pretty much as far north in the state as you can get. We were wandering around looking for the Deckertown Turnpike and the scene of Kilpatrick's Reenactment when we came upon the Milford-Montague Toll Bridge where 206 crosses the Delaware River. 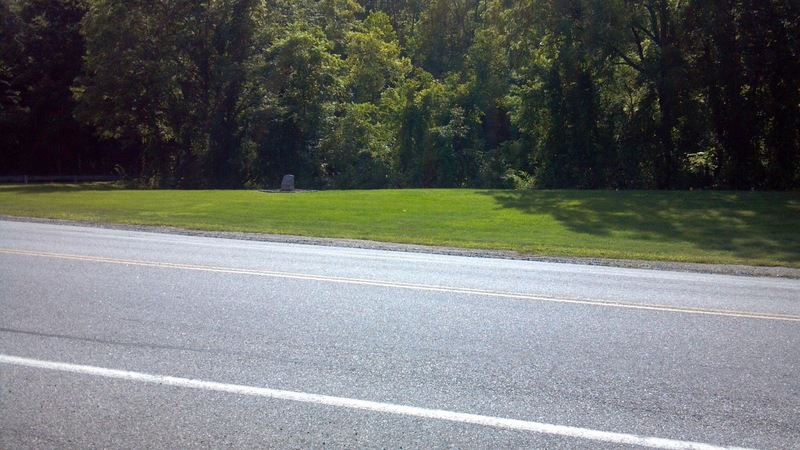 Today, there's a somewhat awkward five point intersection where County Road 521 branches off from 206 and heads northward while the Deckertown Pike and Old Mine Road start and radiate outward. It all looks oddly sanitized and overly engineered, much different than most of the more natural-looking crossroads in Sussex County. Instead of the usual church, general store or gas station, there's just about nothing, save one of those wonderful county historical markers. Montague Toll Bridge on Route 206. 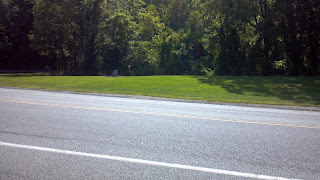 We stopped to discover we'd found the site of the village of Brick House, once the commercial center of Montague. The WPA Guide to 1930's New Jersey described the community as "scattered along the two-lane macadam highway with a few worn houses, a gas station before the old country store, and the old Brick House Hotel (open)." The Hotel had indeed been old, even during the Great Depression. Built sometime between 1721 and 1780 along a former Indian trail, it had been a key stop on the Buffalo-Hoboken stagecoach route. Over the years, the brick, wood and stone structure was enlarged to include a barroom, sitting room, dance floor and nine sleeping rooms. A village grew around it, with sufficient commerce, a school and two churches to serve the local population, mostly farmers and their families. The first strike against Brick House came in 1943 with a devastating fire that took the general store. Less than 10 years later, when Route 206 was realigned to meet the new Milford-Montague Bridge, the Brick House Hotel was taken by eminent domain, condemned and demolished. The final and most lethal blow to the community was dealt in the early 1960s, with the introduction of plans for the Tocks Island Dam. Conceived to manage downstream flooding and generate hydroelectric power, the project was designed to create a 37-mile long recreational lake by flooding property surrounding the Delaware and designating thousands of acres of land as a park. Depending on which reports you read, the Federal government either declared eminent domain or strong-armed residents off their property, leaving virtual ghost towns to be torn down before the river was dammed and the area was flooded. Brick House sat within the borders of the proposed project, and its remaining buildings were either demolished or displaced. Ultimately, a combination of factors stopped the project, which was deemed both geologically unwise and unfair to the families who'd lived there, in many cases for generations. The land, already out of the hands of its original owners, was transferred to the National Park Service in 1965, creating the Delaware Water Gap National Recreation Area. 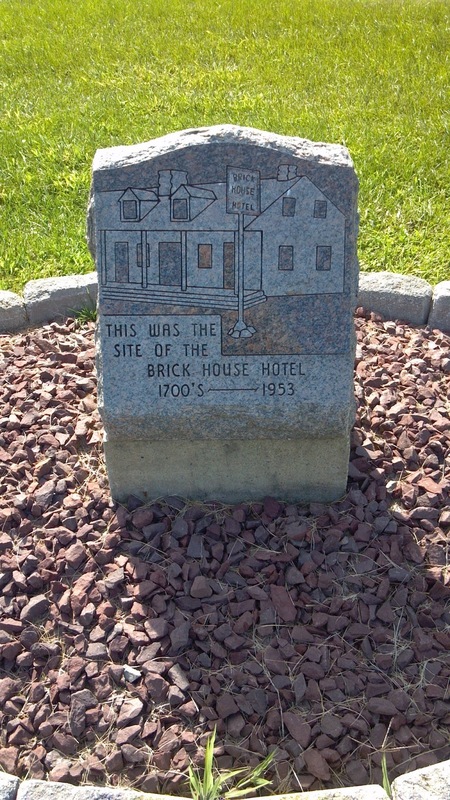 However, it was already too late for Brick House village, whose crossroads location is commemorated now only by the blue historic marker and what might be considered a gravestone for the hotel that lent the community its name. 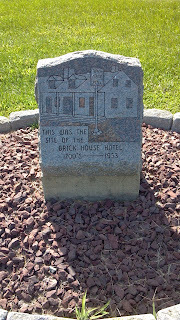 The Brick House Hotel was run for a time by my grandparents, Frank and Lillian Herman. It's where my mother grew up. I never saw it; it was torn down before I was born. Wow! It sounds as if it was a really nice place, and a wonderful area to grow up in.